Kathmandu city is south of the Great Himalayas at an altitude of 1,500 m. It is traversed by the Bagmati River and its affluents, around which a number of sites have been developed, including the durbars of Bhatgaon (Bhaktapur), Patan and Kathmandu, the Buddhist stupas of Swayambu and Boudhanath, and the Hindu temples of Pashupatinath Temple and Changu Narayan. In Kathmandu city there are many historical and cultural monuments, including serveral pilgrimage sites for Hindus and Buddhist. 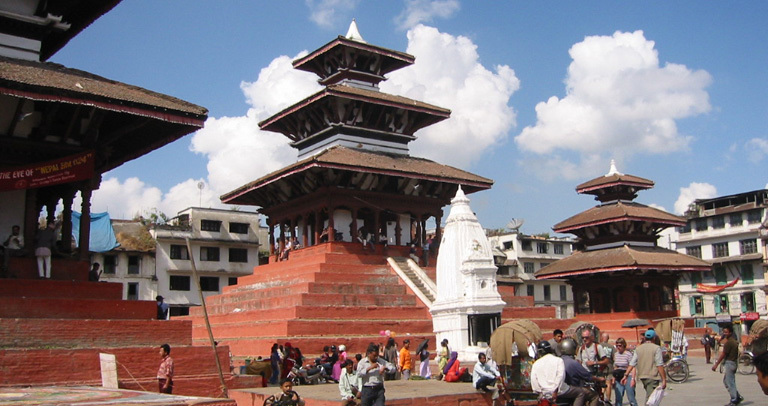 Visit Pashupatinath Temple, Boudhanath and Bhaktapur Durbar Square. Overnight at Hotel. Locally called as Hanuman Dhoka Palace Square - an ancient seat of the Nepalese Royalty. Hanuman Dhoka Palace Complex consists of a huge Royal Square imposing a tremendous variety of temples dedicated to different Hindu gods and goddess. Most of the buildings we see here date from 15th to 18th century. The entire Palace Complex here is named after a monkey god called Hanuman. One can see a huge stone statue of Hanuman painted all red right next to the main entrance (the golden gate) of the palace. Hanuman here is regarded as a powerful protector of the entire Durbar Square. Located in a lovely little hill rock Swoyambhu Nath Stupa is one of the most fascinating architectural jewels of the world. This great Stoup is said to have been built around 250 B.C. Generally a holy memorial site Stoup represents a typical Buddhist architecture. The Stupa of Swoyambhunath stands on a typically stylized lotus mandala base-a long time ago believed to have originated from a legendary lake of Kathmandu Valley. One of the oldest and the biggest Buddhist monuments ever built in Nepal, Boudhanath is an imposing structure standing some 36 meters. The Stupa stands on the massive three level mandala style Platforms surrounded by colourful private family houses. The basic feature of this great stupa is very much like that of Swoyambhunath stupa except its finial displaying. It is much bigger than Swoyambhu stupa and lies on the valley floor whereas the former one stands on the hill top. This stupa is said to have been built in 5th century A. D. The site is considered very much like Mecca for the Tibetan Buddhists and every year tens of thousands of pilgrims from all over the Himalayan region visit the stupa. Pasupatinath is considered one of the holiest shrines of all the Hindu temples. The temple has remained the presiding deity of ruling Nepalese Royalty. Located on the banks of the Bagmati river, this two tiered magnificent golden temple with four triple silver doorways is unique example of the Nepalese temple architecture. It is one of the largest Hindu temple complex in South Asia with hundreds of Shiva lingams, shrines icons of various Hindu god and goddess insides. We have Join-in small group with fixed departure dates so, please kindly check our departure date list as given below and select one from them or if you couldn’t find the suitable date for you travel schedule, please contact us and we will help you to plan a holiday according to your schedule. And also please note that this is tailor-made tour. You can add or reduce the days as per your time availability. All tailor-made trip or same trip can be organized on private basis. Hadi and I really enjoyed our stay at Kathmandu, your country is beautiful and we enjoyed all that we saw and did. It was a big pity we had to return early for work. We would like to give a special thanks to our guide, Ramesh, he always greeted us with a smile, was very helpful and courteous. Our driver was very punctual and pleasant aswell. Thank you once again for the wonderful time I had in Nepal during my 6 days stay in July 2007. Nepal is one of most amazing places I have ever visited and due to your professional services I felt perfect and was able to discover most for the quite short time I stayed. Beautiful country and extremely nice and helpful people. Big thanks goes also to all member of your team and especially to Ashok who supported me during the city tour in Kathmandu. Many thanks and best wishes to Mr Chaman Thakur, Manager of Discovery Full Circle tours, your partner touroperator in Delhi, who arranged my stay in India with lots of professionalisms and dedication. In Nepal besides Kathmandu I traveled to Nagerkot and Dulikhel and all this was unbelievable nice experience. Would highly recommend to any new customers to use your services, since you and your dedicated team not just only do job properly but getting friends with your guests and this makes any Nepal trip unforgettable. And definitely will come again. Nepal is the ultimate place everybody visited once is eager to come again. Our wonderful flight for my party of six, was made possible by Roka and the friendly staff at Friendship Nepal Tours. Although we had to cancel our first trip due to weather delays, Roka worked to get us rebooked and flying on our only other available morning. Believe me, this service is well worth it, especially with the uncertain conditions which are typical for the Himalayan range-5 star rating ! Thanks to Roka and his team, we had an AMAZING Nepal experience! Where do I begin to sing praises about this tour group? We visited Nepal for 13 days and wanted only to tour for 9. I contacted Friendship Nepal Tours and Roka worked diligently with me to meet my request. We had excellent accommodation and those that he did suggest, I checked on TripAdvisor and from that, requested that a couple of the hotels be changed, which he did. My husband was sick the second day of the tour (we had been so very, very careful!!) but Roka took it in stride and changed our plans around so hubby could rest. Our guide, Ramesh, for Kathmandu was extremely knowledgable of the legends, history and religious beliefs. Our driver was Mohan and was excellent. Many of the roads are in deplorable condition and driving is unlike anything I have ever experienced in all of my traveling days but I felt completely safe with Mohan at the wheel. Unfortunately, the last day of our trip, I fell and cut my head real badly. Ramesh and Mohan were so very helpful and attentive. We tried to send them home from the hospital as it was getting late but they insisted on staying. They were both a huge help and comfort....I was fine..needed two stitches and fortunately no concussion or broken bones! From Kathmandu, Mohan drove us to Chitwan Jungle area. All arrangements for the hotel, meals and guide were arranged by Friendship Nepal Tours and our time there went smoothly. From Chitwan, Mohan drove us to Pokhara where an overnight hike to the Australian Camp had been arranged, as well as a tour of Pokhara. Our guide was Rams and again, he was top-notch. Rams helped arrange a helicopter tour to Annapurna Base camp, that proved to be the highlight of our trip. If you are looking for an A-1 tour group to help you explore Nepal, look no further...this is the one for you! Any Optional Sightseeing Tours and extension of hotel accommodation etc. Tips to guide, porter, driver etc.